Never before have I met more compassionate and caring business owners. I am a #DisneyWorld Cast Member and I speak to a lot of guests. What I don’t speak to are many of the companies our guests do business with, including the outside #OrlandoScooterRental companies. Scooter vacations would be the exception. 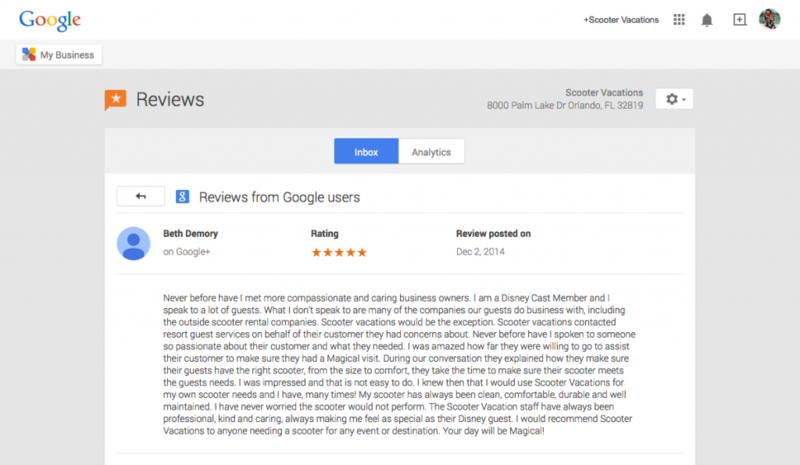 Scooter vacations contacted resort guest services on behalf of their customer they had concerns about. Never before have I spoken to someone so passionate about their customer and what they needed. I was amazed how far they were willing to go to assist their customer to make sure they had a Magical visit. During our conversation they explained how they make sure their guests have the right scooter, from the size to comfort, they take the time to make sure their scooter meets the guests needs. I was impressed and that is not easy to do. I knew then that I would use Scooter Vacations for my own scooter needs and I have, many times! My scooter has always been clean, comfortable, durable and well maintained. I have never worried the scooter would not perform. The Scooter Vacation staff have always been professional, kind and caring, always making me feel as special as their Disney guest. I would recommend Scooter Vacations to anyone who need to rent a scooter in Orlando (Click here to see our models) for any event or destination. Your day will be Magical!